If you’ve been reading our blog for any amount of time, you probably know that Tim is DIY guy. From customizing bikes to making stoves to making a camera stick, Tim likes to make and do things himself. He rarely hires out work that he knows how to do himself. Because he’s a perfectionist. And he’s cheap. And he likes DIY projects. And I love those qualities in him. Several locals we met in San Diego recommended shops that would pack and ship our bikes for us (for a price). Drop the bikes at the shop and give them your credit card, they take care of it all. But Tim wasn’t interested in hiring out bike-packing and shipping, even if doing it ourselves would be difficult. After riding to the border and dropping the kids at the hotel, Tim and I pedaled 10 blocks to the Amtrak station on both tandems. I guess we could have ridden just one tandem. But we didn’t want to bother the front desk to check in one bike, just to come back a half hour later to check in the other. So we both pedaled tandems without stokers to the Amtrak station. Tim went to the ticket window and bought one bike box. Since we were only shipping the frames, not entire bikes, he was sure he’d be able to fit both frames in one box. Thankfully Tim is not spatially challenged like his wife. I trusted he knew what he was doing and that both frames really would fit. We planned to fill the trunk of our rented car with the rest of the bike parts (wheels, racks, saddles, handlebars etc) along with our panniers and other gear. 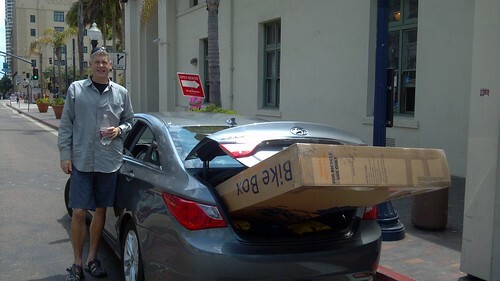 We knew it might be a tight fit, but thought any trunk of a mid-sized rental car could swallow all of our gear. We walked the bikes back to the hotel since Tim was carrying a very large and awkward box. 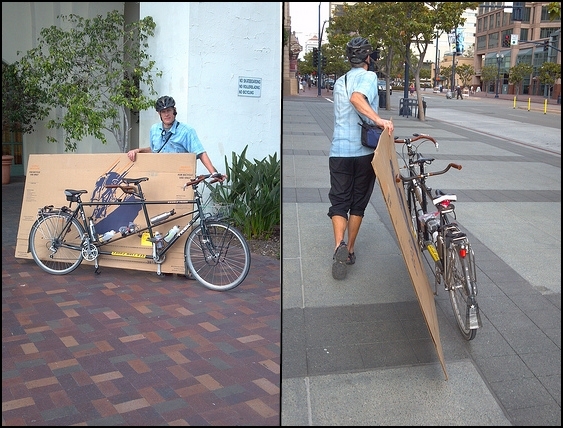 Even without a cargo bike, carrying the bike box on a tandem worked pretty well. Tim just set the box on the pedals and balanced it against the frame. I know we looked pretty odd walking down the sidewalk balancing a bike box on a bike. But we are used to odd. We pretty much live our lives in the odd zone, so this short trip didn’t faze us. Once back at the hotel, we checked both bikes and our newly acquired box back into the manager’s office. Our reserved rental car couldn’t be picked up until the morning. And since our plan to load all of the wheels, racks and bike parts into the trunk of the rental car required that rental car, there was nothing left to do today. If Tim started disassembling the bikes right away, we’d have a big greasy mess on our hands. And we didn’t want that. The rest of the work would wait until tomorrow. The next morning featured more of the same. Bing, mom’s awake. Again, my brain started buzzing at the crack of dawn with items from our giant must-do-today list. I laid in bed quietly fretting and woke the family for breakfast once the dining room opened. We trudged down to the hotel dining room for a quick breakfast. No time for lingering today. After breakfast, we sent the kids upstairs to watch TV while we walked to the nearby rental car agency to pick up the car. The rental car agency wanted to give us a Dodge Charger, which had an enormous trunk that would have easily swallowed our gear. But we couldn’t do it. Can you imagine us driving a Dodge Charger? We turned down that wanna-be muscle car and opted for the more fuel-efficient, Hyundai Sonata, instead. The trunk looked big enough for all of our gear and the interior was roomy, even for Mr. long legs. We drove back to the hotel and I sweet talked the valets into letting us park in the valet-load-zone near the hotel entrance. We needed the car nearby so we could load it up with bike parts as Tim disassembled the tandems. I did my best to help with the bike disassembly. But I’m not super handy. And we didn’t have 2 sets of tools (I know, lame excuse). Tim stripped the bikes down to the bottom bracket and brake calipers using only a multi-tool and a borrowed crescent wrench for the headset! Unfortunately I didn’t take any photos of the process. You’ll just have to believe me that the sidewalk-bike-disassembly was both entertaining to passers-by and the nearby valets and quite impressive. DIY guy rules! Once Tim finished disassembling the bikes and packing both frames in the box, we left the giant box on the sidewalk and asked the valets to keep an eye on it. We sprinted upstairs to shower and check out, a little past normal check-out time. (We had already asked the front desk staff for a late checkout and they were very gracious and accommodating.) The staff at the hotel definitely gets a 4 star review from us! 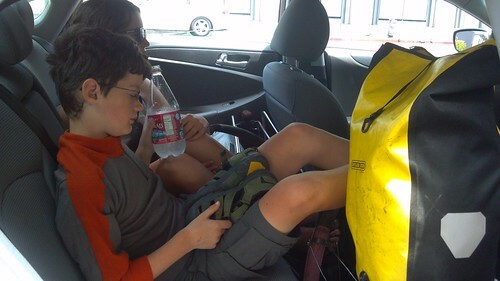 We crammed the giant box, the rest of our gear along the kids into the car for the short ride to the Amtrak station. The kids had their feet up, resting on fenders and wheels and handlebars. And I sat on a pile of panniers in the front seat. I knew if we didn’t all fit in the car, some of us could walk to the station. But we fit. Beverly Hillbillies reunited in San Diego! As we drove away from the hotel, our friendly valets enjoyed a few laughs at our expense. We gave them some friendly honks and cheers for good measure. And we laughed and joked about how ridiculous we must look all the way to the station. Tim took the bike box into the station and paid for its fare to Seattle. The bikes would probably beat us home, but the agent assured us they’d hold the box at the Seattle station until we returned. Once the giant bike box was gone, the trunk easily swallowed the rest of our gear! After all that work, we were starving. Before heading to the zoo for the rest of the afternoon and evening, we drove to the nearest In-N-Out Burger for lunch. On the way to the restaurant, our daughter wrote out an order for the family entirely from the secret menu. Animal style for Tim, some cheese fries, extra crispy fries and multiple variations of shakes. You can have exactly what you want at In-N-Out! Our work finally done, now it was time for some tourist activities! 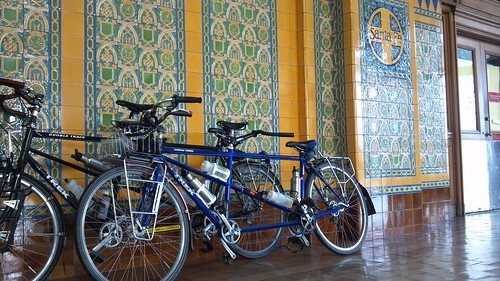 We hope you enjoyed our account of our two-summer, two-Tandem Pacific Coast Bike Tour. Leave a comment or send an email if you have specific questions about the tour or about family bike touring in general. This entry was posted in bike touring, bikes, Pacific Coast Bike Tour and tagged 2013, acapaccoast, bike touring, bikes, CA, carfreedays, family bike touring, Family Cycling, kids, OR, Pacific Coast Bike Tour, shipping tandem, tandem, tandem bike box, tandem bike tour, tandem shipping, two tandem bike tour. Bookmark the permalink. Thanks Marge. Anne deserves special credit for sticking with the travelogue until the end. I know it was a lot of effort, but I think the info will be useful for other (and a good reminder for us) in the future. I really enjoyed reading about your vacation/adventure. I had no idea how complicated it could be to transfer from bikes to rental car — good information. I hope you got to sleep in the next morning, with no pressing to-do list. I loved this series, sorry that it’s over! Shipping two tandems is a huge pain. Folding bikes next time, for sure! And yes, there was sleeping in the next two days in a row. Congrats on completing such an astonishing adventure! Thanks Jared! And thanks for reading. I am just totally impressed with the whole adventure that you have accomplished over the last two years. Through all the thick and thin, good times and bad. You all as a family persevered and made it to the border. What a great trip and story to remember for years to come. Great blog entries too. After winning the long coastal trip? Where will you go next? Jim! So great to hear from you. You always inspired me with your climbing/hiking/skiing adventures back in the pre-social media days (back when people had adventures for themselves — maybe showing a slide carousel worth of images to friends afterward, at most!). Your praise means a lot! Next up is a skiing winter and a close-to-home summer. We hope to introduce the kids to mountain biking and backpacking. I have vagues memories of you having a favorite, one-way trip over the Cascades to Lake Chelan. I’ll have to get the details on that one!